This summer Dakota and I have gotten into the habit of taking an early morning walk while the rest of the family sleeps on. It’s become sort of a meditation, because he is a meanderer and forces me to slow down. I thought about this post and what I wanted to write about. The idea of responsibility came to mind as I had been journaling about others taking responsibility. In order to understand what someone else is going through, I try to put myself in their place as much as I can. Even if I cannot completely understand what they are feeling or going through, I can at least empathize and appreciate their feelings. This idea of taking responsibility for our own actions, past digressions, and happiness keeps coming up. So in order to walk in someone else’s shoes, I thought about my own life. Am I truly taking responsibility for what happens in my life? Do I believe outside forces are responsible for my happiness? Do I blame others wrongfully when something doesn’t go my way? That’s a lot to think about. On Shark Tank last night (Luke loves this show), one of the investors refused a woman’s product, because he felt she was all over the place. She worked out a lot, had three kids, was trying to market this paleo bar, and also carried another job. He said she put so much effort into everything, that she wasn’t good at the one part they were interested in. She was spread too thin. Now it’s a bit hard to focus on only one aspect of your life when you are a parent and still want to be successful in a career. But she seemed to have a few careers going. My husband and I looked at each other. We both pointed our fingers at me. Very often I blame my lack of time for my inability to get work done. But if I really look at it, I have so many projects on the table, it is hard to be successful and not feel harried. Instead of blaming the 24-hour day, I need to look at my priorities, my purpose and goals, and cut out what isn’t serving me anymore. That’s hard to do when I feel responsible for others. There’s that word again. In a sense, I’m not taking responsibility for what happens in my life. I’m letting others or situations dictate it. And I’m also taking responsibility for others when it’s not my job. But I’m a fixer and a nurturer, so it’s very difficult for me to let others fall. In the end, however, I’m making it worse for them. Everyone needs to grow by failing and getting up on their own. On a positive note, I know I am responsible for making myself happy and so surround myself with those I love and who love me. Those who empower me and make me laugh. The hard part is making those changes when we aren’t very happy. Knowing what it is and making small changes may be enough, but sometimes we have to take a leap of faith and follow our own path, not others. As you can see I have a bit of journaling to do about this responsibility topic, but it can wreak havoc on our lives if we don’t take responsibility for ourselves, own it, and move forward. Are you taking responsibility for what is happening in your life right now? Do you feel you are responsible for your own happiness? If yes, what do you do to create that happiness? If no, who do you feel is and why? Do you blame others when things go wrong or do you accept your role, take action, apologize if necessary, and move forward? How do you feel either way? He called me after work and with an excited voice, told me he had a great day. He met new people, did work that interested him, and received compliments on how quickly he caught on. Now I’m not saying that my advice turned his whole day around, but perhaps it shifted his perspective. Be nice. In any situation, if you think you are going to have a bad time, then most likely that is what you will have. If you put a smile on your face (even if you don’t feel it at that moment), you will attract kindness and good things will happen. Then your smile and happiness will come naturally. Be grateful. It’s difficult to remember to be grateful, especially when we are on this constant stream of movement, catching up, filling our time, and forgetting to be in the present moment. This morning as I walked my dog, I appreciated the quiet, the sunshine, and being able to take this time for myself. Being grateful for an opportunity opens us up to possibilities and again puts that smile on our face because we are in a good place. It’s a reminder. Find the good. The door to goodness opens when we allow ourselves to look. In every dark place, there is light. Even when there are clouds, the sun is still shining, but it’s hard to remember that when the darkness overwhelms us. Each day note what was good and take notice of the people who nourished and empowered you. Keep them around and keep doing what makes you happy. These moments make those darker ones a tad bit lighter. What is a situation where you can be nicer or kinder? Where can you find goodness in your day? What is positive? Who do you want to be around who will make you happy and put a smile on your face? What can you do to make it happen? Every day, be nice, be grateful and goodness will find you. I feel like I have been afloat on a journey that took me on a different route, but now I have landed. When we challenge ourselves in an academic or physical manner, other goals and our regular lives get disrupted or put on the back burner. This recently happened with me and now that I’m back to the normal rhythms of my life, I need to become grounded and prioritize what I want to be in my life–what is next on my path. My meditation this morning was about being in the present. The narrator had me look around and absorb what I saw. I had a mini-panic attack, because my office area was a tad bit messy. Not to the degree it has been, but it needs a clearing out. But then she said to embrace it and not use this time as an escape. That actually calmed me. I often use anything I do to escape what may be stressful in my life. And that can be OK–like when you read a great book and become a part of that world or do an exercise that completely takes all your attention or do an activity that you are focused on. You aren’t thinking about your problems or the bazillion activities you have to do. You are in the moment. Life doesn’t get less stressful. By becoming more grounded and planted in the moment, the craziness and the mess won’t throw us off. We don’t need to escape; we only need to embrace where we are and then act based on our priorities. My priority is to keep the space that finishing my goal has given me, and only fill some of the time with something that means the world to me. Being with my son while he is home for the summer is a priority. It’s a fleeting moment having him home, and I want to embrace it and be present. What grounds you? What do you want to embrace right now? What goal are you working toward? How does it serve your purpose or fulfill you? 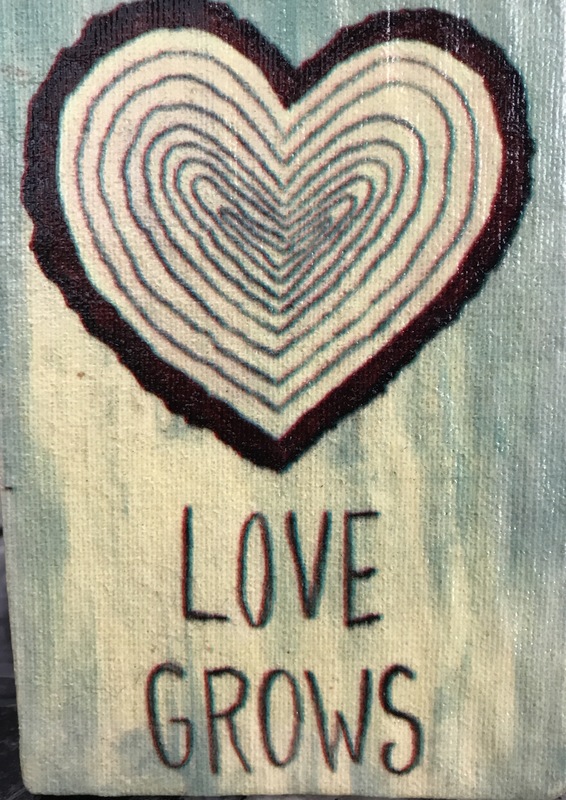 Luke and I were in Charleston, South Carolina, and I found these blocks of wood painted with different types of hearts and themes of love. I immediately bought them all. The messages were simple and universal. 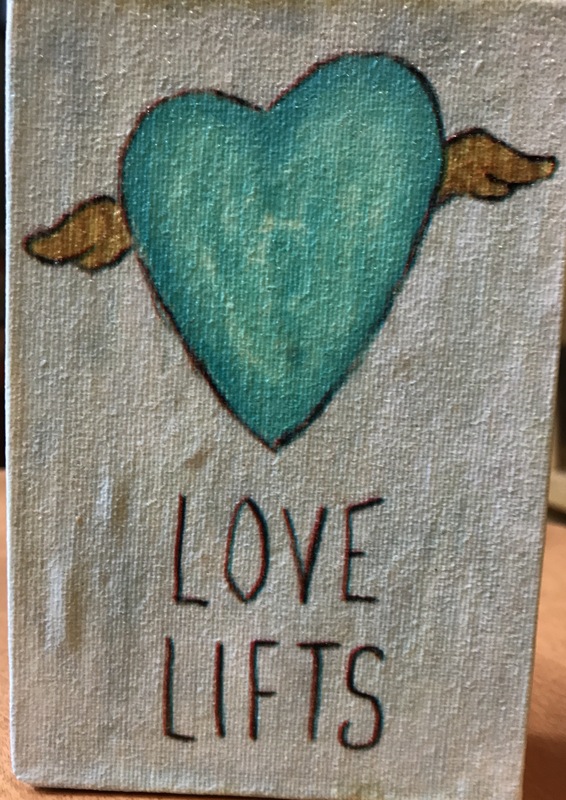 Love Lifts us up if we allow it. When life knocks me down, I’m struggling with a problem, or my mood is low, I reach out to the ones who love me. I know without asking that they will lift me up. When I do this or my friends and family need support and it is positively received or given, then Love Grows. Trust in everyone grows and love and relationships deepen. It’s like the root of a tree that depends on the earth to hold it up. One sustains the other. In all I do, I try to put love and kindness first. When meeting a new person that means really seeing them and listening. 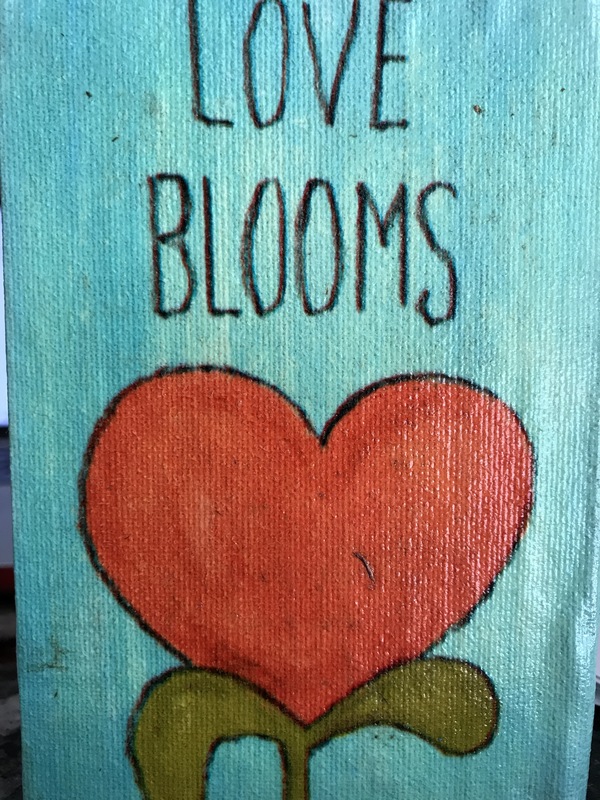 Love Blooms when we are open to possibilities, synchronicities, and happiness. How lonely we would be always shutting people out. The next person I meet could be the one to help me further my purpose or be a major influence and joy in my life. Over anything, Love Reigns. Love for myself, my husband, my boys, my family and friends, and the world. It is the single biggest motivator I know. As long as I have love, I have hope. As long as I know love, I have purpose. 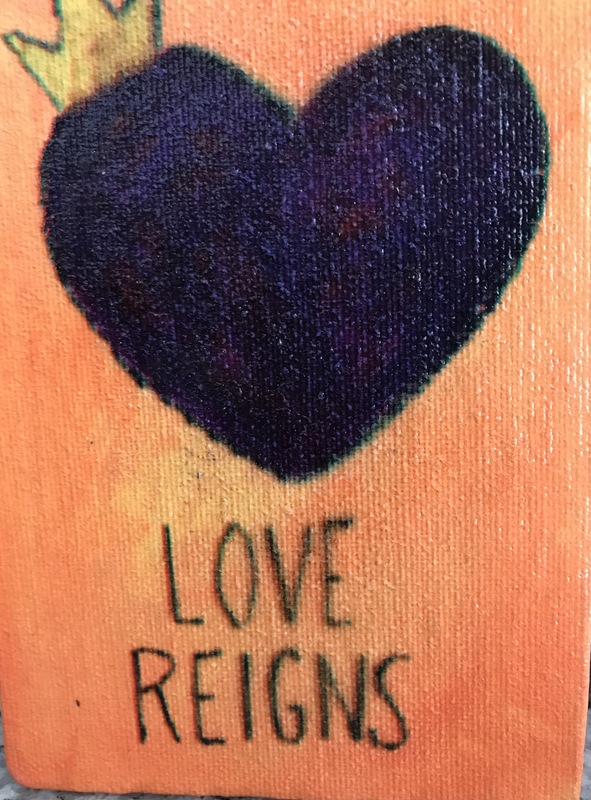 What does love mean to you and how can you bring more of it to your life and those around you?